Volkswagen revealed the new 2015 Volkswagen Polo GTI in October last year. 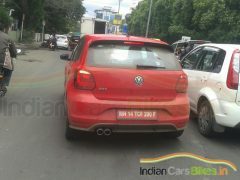 However, now, in a surprise of sorts, first-ever spyshots of 5-door Volkswagen Polo GTI undergoing a road-test on Indian public roads have surfaced on the cyber space. 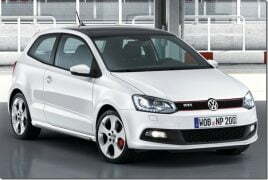 This sighting is in line with a recent report from import-export website Zauba.com, which states that VW India recently imported a unit of the Polo GTI for testing purposes. Here, in this post, we’ve put together all the important details on the 2015 VW Polo GTI, along with spy pics from the recent sighting in the country. 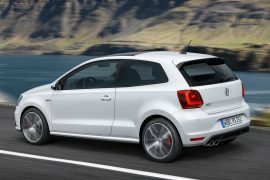 The Polo GTI is powered by a 1.8 L TSI motor that produces a maximum power of 190 bhp and a peak torque of 320 Nm. 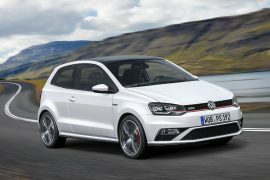 If company figures are to be believed, the Polo GTI can dismiss 100 km/h from standstill in 6.7 secs and hit a top speed of 236 km/h. Internationally, the engine is available with a 6-speeds manual gearbox and a seven-speed dual-clutch automatic transmission. Highlights of the car’s front-end include a honeycomb-mesh grille, LED headlamps with Daytime Running Lights (DRLs), dual exhausts, side skirts and sportier front and rear bumpers. At the rear end the bumper looks sportier and has twin exhaust. In the cabin the car has flat-bottom steering and a new display panel with a touch screen. 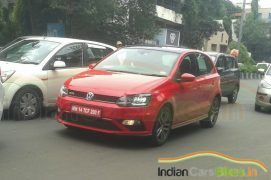 Stay tuned to Car Blog India for more on the 2015 Volkswagen Polo India launch prospects.